Releasing urea, excess salts and excess water as urine. Blood is brought to the kidneys from the renal arteries. Urea and other substances are filtered out of the blood to form urine. The cleaned blood flows out of the renal veins and the urine is excreted. Renal dialysis is an artificial kidney machine which filters the blood. The word ‘dialysis’ means ‘splitting into two’ and refers to the way a patient’s blood is purified by separating off the unwanted waste products such as urea by the dialysis membrane. The kidney dialysis machine works like a real kidney. The filter in the machine is visking tubing. The tiny holes allow small molecules such as water, ions, and urea pass through but not big molecules such as cells and proteins. One side of the membrane the patient’s blood flows and the other side a special dialysis fluid which has to be changed every few hours. To achieve dialysis it’s usually easier to use a vein that is closest to the skin and also has a large lumen. However, the pressure in a vein is low so has to be attached to an artery for the necessary pressure. The kidney dialysis is a complex and expensive piece of apparatus. A kidney transplant is preferred. Humans can live happily with one kidney but when both kidneys fail they would die in a week because of the poisonous waste building up in the blood. The problem with kidney transplants is that they kidney is rejected by the person’s immune system and they begin to attack as it has foreign antigens. We say the organ has been rejected. There is a way to avoid this: using a kidney from a close relative as they would have similar antigens. The patient will need life-long medication to prevent the kidney being rejected. This suppresses the immune system so the patient may catch colds more easily. Each kidney contains thousands of tiny, microscopic tubes called nephrons. Blood flows in a network of capillaries called a Glomerulus which runs inside the Bowman’s capsule of the nephron. The high pressure of the blood squeezes small molecules through the tiny holes such as water, urea, ions and glucose. Big molecules cannot fit through the holes and stay in the blood. This process is called filtration. Some substances are reabsorbed if they are useful, like glucose. All the glucose is selectively reabsorbed – it is moved out of the nephron back into the blood against the concentration gradient. Sufficient water is reabsorbed, according to the level of ADH. The process of maintaining the right water content in the body is Osmoregulation. Urea and excess water are not reabsorbed. 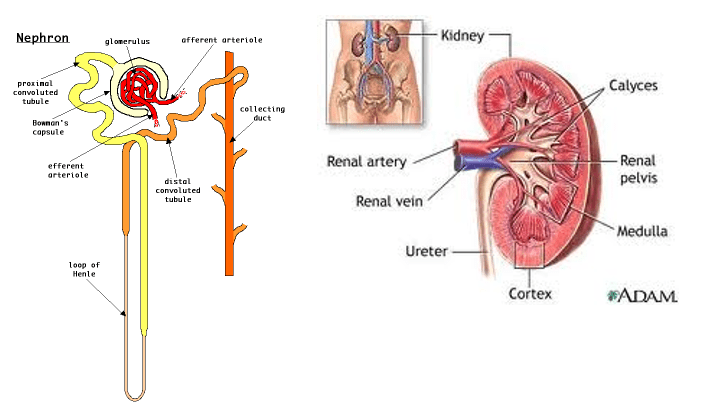 They continue out of the nephron, into the ureter and down to the bladder as urine. Urine is released through the urethra. The hormone responsible for controlling the water content of the blood is called Antidiuretic hormone – ADH. This is found in the pituitary gland and is secreted by it. The control of water content is a good example of negative feedback. This is where a change in a factor leads to the opposite change happening to keep things fairly constant, even if they keep changing. Step 1: The brain senses there is not enough water in the blood. Step 2: The pituitary gland secrets more ADH. Step 3: The ADH causes the kidneys to reabsorb more water. Step 4: A small volume of concentrated urine is produced. Step 1: The brain senses there is too much water in the blood. Step 2: The pituitary gland secretes less ADH. Step 3: This makes the kidneys reabsorb less water. Step 4: A large volume of dilute urine is produced.